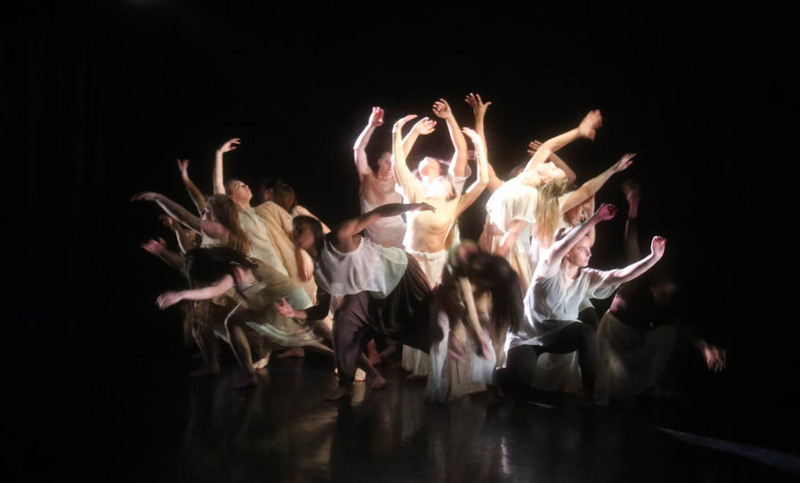 Students on the BA Dance Studies and BA Dance Performance degrees recently performed choreographic works by four professional choreographers. Working on the performance gave the first year students an opportunity to experience what it takes to work as professional dancers. As part of the module they are assessed on their commitment and professionalism throughout the project, as well as the final performance. Louise Kelsey, Programme Leader for BA Dance Performance at Middlesex, believes it’s vital for students to get this kind of professional experience early in their studies. “The year one performance module offers student dancers the opportunity to work with professional choreographers who are currently creating new work in the field,” she says. Jac Coxall, one of the guest choreographers, graduated from BA Dance Studies in 2016. He is now performing professionally in both commercial and contemporary dance, as well as teaching within vocational and higher education settings. “It feels like yesterday that I graduated. The level of talent at Middlesex continues to grow, the new students are fantastic,” he says. The other guest choreographers on the first-year module were Sarita Piotrowski and Mbulelo Ndabeni N’da – both developing artists in contemporary choreography. Joshua Gillies, a BA Dance Performance student, found working with Jac an extremely valuable experience. “I have come to a realisation of who I am as a dancer and the steps I need to take to improve,” he says. For the latest news and opportunities to engage with dance at Middlesex University, follow @MdxUniDance on Twitter.